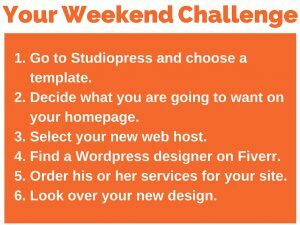 It is Friday and we will be creating a weekend challenge and this weekend, you are going to work on getting your website redesigned. Now, I am not going to say that it is going to be completed this weekend. But you can make progress in getting it done. This episode will be more about the process of getting it done. You will need to get your pad to write on and a pen or pencil because you will want to take good notes on this one. So first, let’s answer the question — why do you need to get your website redesigned? I am going to assume that because you are listening to this podcast, that your website is not working at all. You might even have a normal business website that is static and does not change at all, and it never gets updated. If you do update it, it winds up costing a lot of money and takes forever. 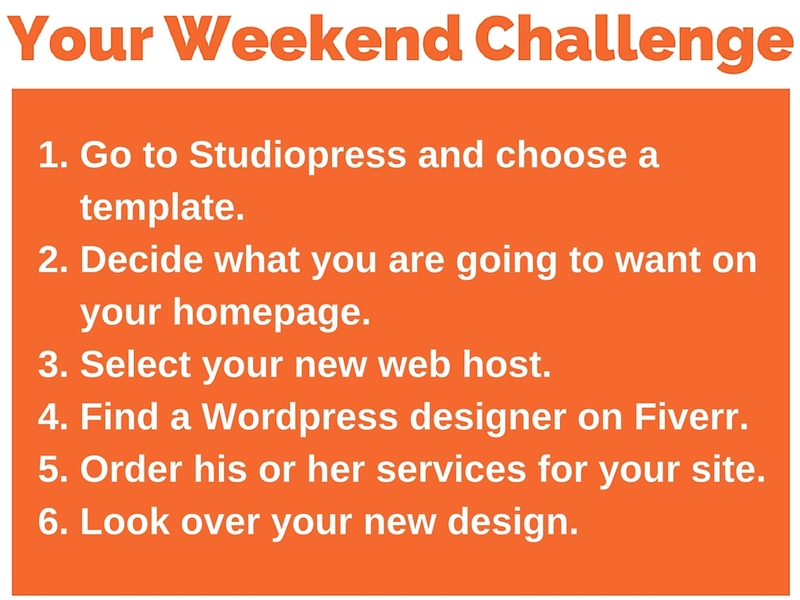 You can do better than the normal generic business website – and that is where this weekend challenge comes in to help you. 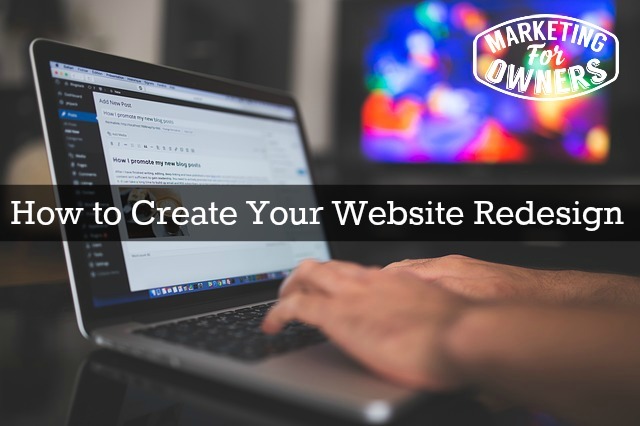 Now, doing this is very minimal when it comes to cost, and you might find out that you like updating your own website and such. Our choice to find templates is Studiopress by Genesis. Go to their templates page and look at all the various templates they have available for purchase. Remember that you need a WordPress blog to use these templates. One thing I want you to know is that these templates have been designed and they do work! Some have specific purposes and used for things like photography, food, church or community. Every single one of these templates can be manipulated. These can be changed at any time. The great thing about a WordPress website is once you have a theme, you can swap it out for another theme and the content stays in exactly the same place as before. Look at the templates on Studiopress and see what their homepages look like. They have designed them so that you can get a feel of what it would like and what kinds of things to list on your homepage. You can take things from your existing homepage and mix them together with the new styles you want to do. You might decide you want your blog posts and your products on the homepage. Now the web host is where your blog is parked. There are web hosts that specialize in WordPress websites. You might say, but I already have a web host. Take my word for it, you might need a new one. Now if you know me, you know I am going to recommend only the good ones and the affordable ones. You might have a friend who has offered to do this for you or host your website on their domain or whatever, but if they don’t work for a large hosting company, don’t do it. You need a great web host. When your site goes down in the middle of the night and your friend in on a holiday, he or she can’t help you. They can only help when they get back from vacation. A web hosting company is available 24 hours a day. I recommend that you use Hostgator (Use our unique coupon code “ownersclub” to get at least 25% discount). If you are in the UK, you can use 123-reg. Now, I don’t want you to have to learn how to do WordPress design. There are people out there that know how to set this kind of thing up. For this, we are going to work on outsourcing and find out how to use other people to get this sort of task or project completed. As a starting position, I am going to stay to go to Fiverr.com and in the search box at the top, type in WordPress Installation. When you do this you will find loads of people who will set up your site for only $5. Pick one and make sure you chose one that has a high rating and great reviews. While you are there, look at some of the other types of gigs they do. If you have something specific that you want to get done, send them a message explaining what you want done and if they can do it, they will quote you a price and do it. Then once you have your price and all your add ons — now all that you need to do is order it! This is a starting point for a new journey for you and your website. Because of you upgrading now, I can start telling you all the fun and free things you can use that will start bringing in money. The answer is probably not – from the start. You still have the same old content just in a different place. This is where you need to get your Fiverr designer involved again. If they can do that, pay them to do it and mark that off of your to do list. You will also want to pay them to change the DNS (domain name server). You do not need to know what all that means. You can look it up if you are desperate to know what it means. What this means is that when people type in your old website address, it will redirect to your new URL. You still have the old one, but your readers and customers will not end up there. They will be redirected to the new site. If you have any questions about this or need more information, just send me an email at jon@marketingforowners.com. I will answer and help you out and give you as much guidance as I can. Are you ready to do a redesign?